Here's a superb new casino online game. Play now! 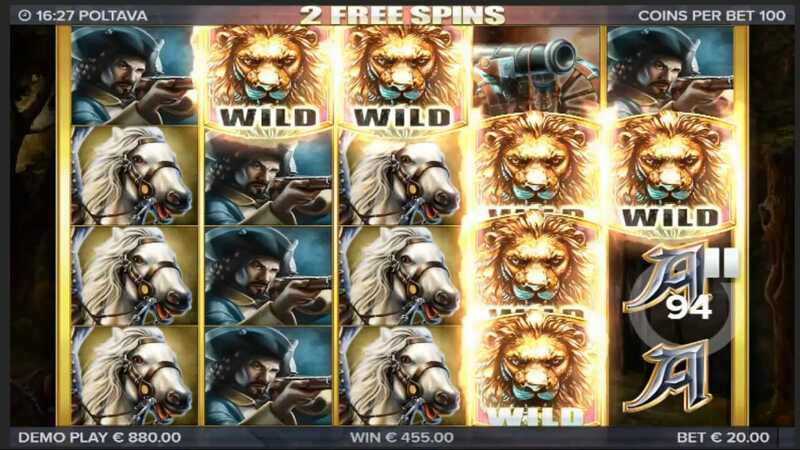 Poltova – Flames of War is a new online slots game of epic proportions. Set in 18th century Ukraine where the Russian army of Peter the Great is battling to the death with the Swedish forces this stunning game is the perfect choice for history fans. Or fans of slots that pay out big prizes! Have a look at other slot games online here on SlotsBaby! Stockholm based Elk Studios have a passion for creating truly beautiful games that not only look great but are a joy to play. They bring characters and scenarios to life through brilliant animations and advanced systems and algorithms. If you love promotions, visit SlotsBaby now. This online slot is full of intrigue and drama, offering challenges and adventure for all who play it. You’ll find yourself engrossed in the stunning battlefield, complete with trenches and weaponry, where Sweden and Russia are going head to head. Are you up to the task? To give the amassed army of awaiting Russian soldiers their orders as they strive to take on the flames of war. This outstanding game is a unique combination of really different gameplay and the basic rules of a classic online slot. With 5 reels and four symbols on each and 40 paylines in total the footprint of the game is really pretty big and if you find the winning combinations of symbols on these paylines you’ll soon see it will bring cash rewards. You can customise settings on the side menu - choosing the wager amount and betting strategy. These strategies are: jumper, optimiser, leveller and booster which will increase or decrease your wager depending on the outcome of each spin. Alternatively you can stick to autopilot mode for an easy and simple ride. Despite being a fairly small paytable compared to other games Poltova – Flames of War has a few surprise tricks up its sleeve. You’ll find the usual classic card icons, from Ace down to number 10 and these will help you win prizes up to 100x the value of your stake. But let’s get onto the good stuff. Three symbols that represent the cavalry, artillery and infantry can trigger the Marshing Reels respin. Get three of these and the Marshing Reels respin will begin, and let battle commence! 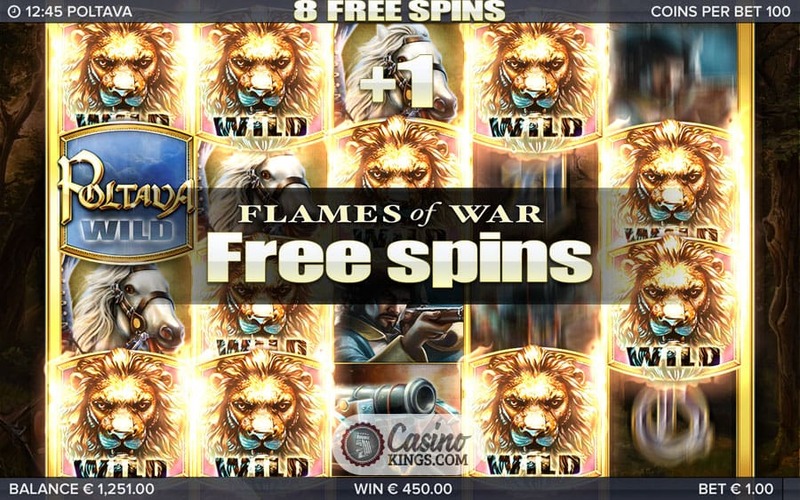 Game logo: This wild card in the form of the Poltova – Flames of War logo can replace any of the symbols listed above and help you score more big wins across the reels. Lion head: Feel the roar of the mighty lion as he turns into a sticky roarsome wild which stays for more than a spin when you land at least 3 on the reels. Each of these sticky wilds will get a free spin as well.